Evelyn “Champagne” King (born July 1, 1960) is an American singer. She went on to become one of the most popular R&B and disco singers of the late seventies and early eighties. 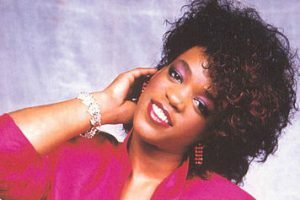 Some of her best known songs include Shame”, and the groundbreaking use of synthesizers on the songs: “I’m in Love” and “Love Come Down.” Credit for the use of synthesizers must go to producer-singer-songwriter Kashif and his production team. Of King’s many R&B and pop hits, she is best known for the disco classic “Shame”, which is her only Top 10 on the Billboard Hot 100 (#9 in 1978) (it also hit #8 on the Hot Dance Music/Club Play chart). The record eventually became gold that same year, and she followed the single with another classic, 1979’s “I Don’t Know If It’s Right” (which also went gold). Both “Shame” and “I Don’t Know If It’s Right” elevated her 1977 debut album Smooth Talk to gold status and success. King was just 16 years old when Smooth Talk was released. Music Box (#35 on the Billboard 200), released in 1979 and Call On Me (#124 on the Billboard 200), released in 1980 were a pair of follow-up disco-R&B albums to Smooth Talk, that featured danceable tracks and soul ballads. However, her follow-up albums did not match the same amount of success as her debut album, due to popular music’s sudden transition from the disco craze of the late 1970s to the 1980s dance music scene. In 1981, King released the #6 gold R&B Album I’m in Love (also #28 on the Billboard 200), and released the title track, which became a #1 Dance and R&B hit, as well as a top 40 pop hit. The song was groundbreaking, in that no one had ever incorporated such heavy synthesizers into their music before. A second single from the I’m in Love album, “Don’t Hide Our Love”, also made it to #6 on the R&B Chart. In 1982, King released the 2x Platinum-certified album Get Loose (#5 on the Billboard 200, #1 on the R&B Albums Chart). It yielded a top 20 pop hit (and #1 R&B hit) with the single, “Love Come Down.” “Love Come Down” is also King’s only UK top 10, peaking at #7. The follow up, “Betcha She Don’t Love You,” was also a #2 R&B smash hit, as well as a #49 pop hit. The title track, “Get Loose”, released as a European single, was a top 10 hit on the Euro charts, as well as a top 40 hit in the UK. The album Get Loose proved to be the biggest selling album of King’s career. In 1984 King had her last top 40 pop hit on the Billboard Hot 100 with “Just For the Night” (charting at #32), from the album So Romantic. It was less successful on the Dance Chart, though, stalling at (#45). Though she continued to have a high level of R&B success, the pop hits stopped coming following her album A Long Time Coming (A Change is Gonna Come). The singles “High Horse” and “Your Personal Touch” were both top ten hits on the Euro charts, and R&B successes in the U.S. Following a move to EMI Records in 1986, her first album for EMI, Flirt, stalled at #192 on the Billboard 200, despite the success of the title track (#3 on the R&B Chart). The album did reach #20 on the R&B Albums Chart. The follow-up album to “Flirt”, “Girl Next Door” failed to chart on either the Billboard 200 or the R&B Albums Chart. Following Girl Next Door King has released several greatest hits compilations, but didn’t release another album until 1995’s “I’ll Keep A Light On” which featured the single “I Think About You” virtually went unnoticed. In 2007, King released her 12th studio album entitled “Open Book.” The albums’ single “The Dance” peaked at #12 on the Hot Dance Club Songs chart. King also collaborated with House DJ/producer & musician Miguel Migs, on the track “Everybody”, which was included on his album “Outside the Skyline”. The single for “Everybody” was released on July 19, 2011. Read more on Last.fm. User-contributed text is available under the Creative Commons By-SA License; additional terms may apply.